Solid sterling silver pendant necklace with green quartz gemstone by Elefteriu Jewellery. 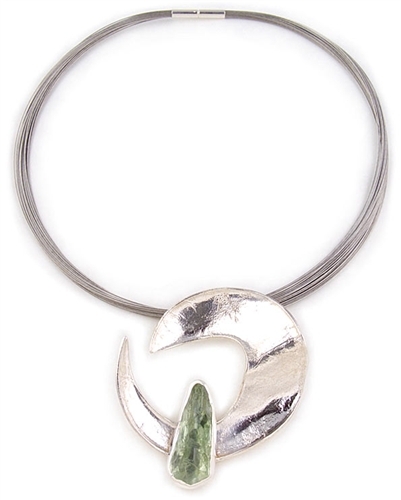 This stunning designer necklace features a sculptural pendant, 6.2cm ( 2.5") in diameter realized in solid sterling silver with the Elefteriu signature crinkled texture and a 35mm x 15mm green amethyst semi-precious stone. Necklace hangs by a unique choker made with strings of satin stainless steel with sterling silver clasp and measures 43.5cm (17.1"). Pendant Diameter: 6.2cm / 2.5"